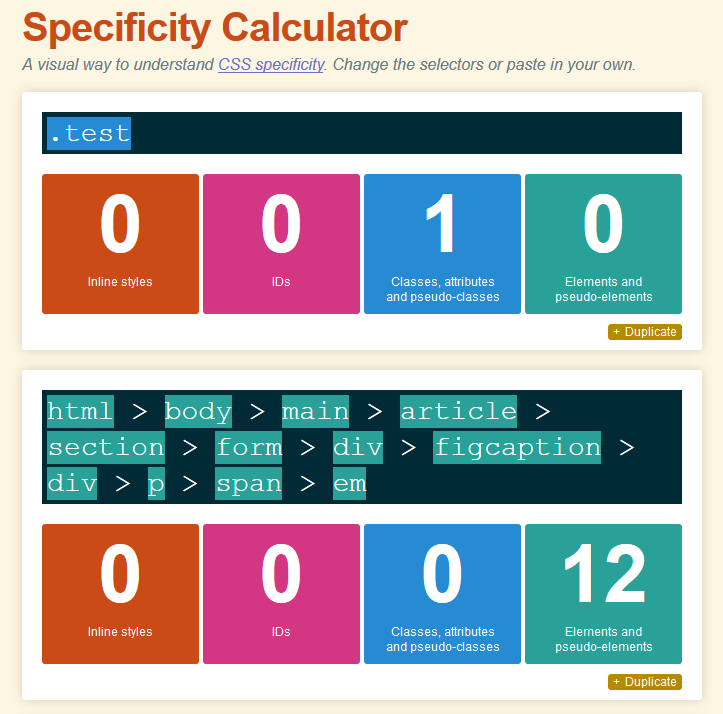 While preparing for interviews I decided I would really, really wrap my head around CSS specificity today. So I read this article on Smashing Magazine and thought “Great! I get it now.” Or so I thought. Based on this formula, the .test selector should have a specificity of 10, and the html body main article section form div figcaption div p span em selector (think I set a record there!) should have a specificity of 12, and the text TESTING 123 should render in red. Some helpful Stack Overflow users explained it a little better — essentially, yes, we do add the numbers together. But it’s not in base 10. In fact, specificity is calculated based on an arbitrarily large number base. In English, that means I could have 100000 element selectors and one class selector, and it would still be green in this example. I can only really compare numbers of selectors in a specific category — so for example 3 element selectors beats 2, and one class + one pseudo class beats one class selector. And incidentally, this is why ID selectors are frowned upon, because I can have one ID selector, and TREE(3) element selectors (assuming your computer didn’t collapse into a black hole), and the ID selector would still win. And then you get frustrated and slap !important on everything and then the whole stylesheet becomes a mess.